The PHD team, from l. to r., top row: Christabel Belonwu, Stephanie Wright, Rebecca Hoerner, Asia Martin-Ingram. Bottom row: Chelsea Franklin, JoAnn Anderson, Lucas Holt. 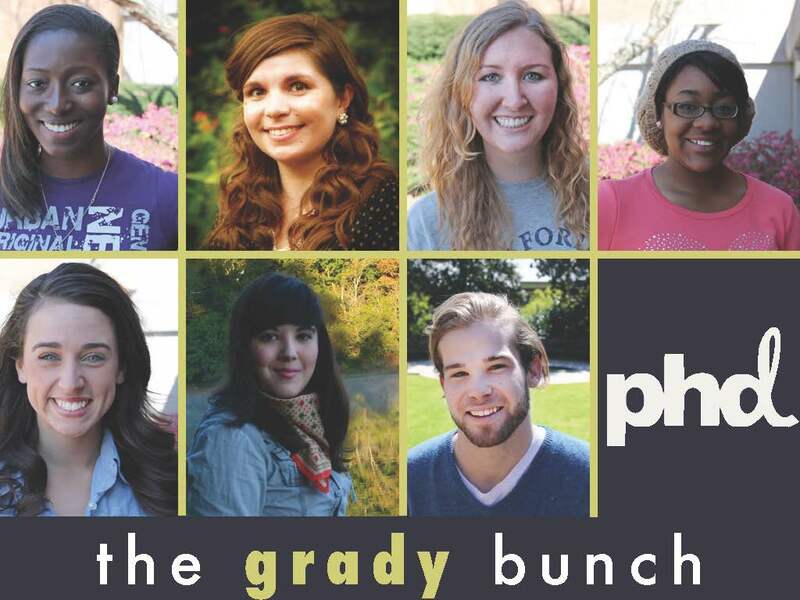 Seven graduating Grady students participated in a six-month research initiative to study Millennial consumer behavior for PHD Worldwide, a global media and communications agency. They presented their findings to PHD and some of their clients in New York this March. The program, now in its second year, allows advertising students to get experience in consumer research and have a chance to present their work to a leading global agency. This year’s “PHD Worldwide – Grady College Creative Collective” consists of: JoAnn Anderson, a second-year master’s student from Lawrenceville with a concentration in advertising; Christabel Belonwu, a senior advertising major from Loganville; Chelsea Franklin, a senior advertising major and Spanish minor from Charlotte, N.C.; Rebecca Hoerner, a senior from Newnan majoring in advertising with a New Media certificate; Lucas Holt, a senior advertising major from Blythe; Asia Martin-Ingram, a senior from Atlanta and Rochester, N.Y., majoring in advertising and psychology; and Stephanie Wright, a senior advertising major from Marietta. Through focus groups, interviews and surveys, the Creative Collective spoke to Millennials in school and in their careers, and researched hot technologies, information context, digital advertising, television, Facebook and brand storytelling. In addition, they surveyed senior advertising students about their knowledge of different kinds of advertising agencies. Based on the students’ findings, they created a report and delivered a one-hour multimedia presentation and fielded questions about Millennial behavior in a Q&A. "This project challenged the selected students to move beyond just collecting and analyzing research data to employing critical thinking skills and stretching their thinking to provide real insights for advertisers,” said Dr. Karen King, Jim Kennedy Professor of New Media in the Department of Advertising and Public Relations, and advisor to the Creative Collective. “Being able to execute and deliver a professional research-based presentation to 30-40 advertising agency executives and their clients in New York is a unique opportunity for our students to showcase their talents. The end product was impressive." and 2012 PHD-Grady alumna Lexia Farris. PHD executives enjoyed the research findings, and have plans to expand the program in coming years. “The students really over-delivered and blew away the audience,” said Craig Atkinson, president and chief digital officer at PHD. “We shared the book with the group account leads and they absolutely loved it. Truly very impressive,” said Tara Nolan, associate director of marketing and communications at PHD. The students learned from their own research about Millennials. "The research made me more aware of the things going on around me," said Chelsea Franklin, who researched and presented hot technologies and student perceptions of agency work. "I paid closer attention to the conversations my friends had, and really noticed any and every advertising technique." “The PHD Worldwide/Grady program challenged me to conduct primary and secondary research among my age group and pull out significant insights for what is so natural to me--Millennial media consumption habits,” said Rebecca Hoerner. “I was given the privilege to work closely with Dr. King and six stellar Grady peers. It was a challenging experience, but I will treasure it forever and it has definitely made me a stronger researcher and advertising student. " "Walking into the agency was a bit intimidating, to say the least," said Franklin. “But it was so rewarding, and everyone was completely attentive and awesome." 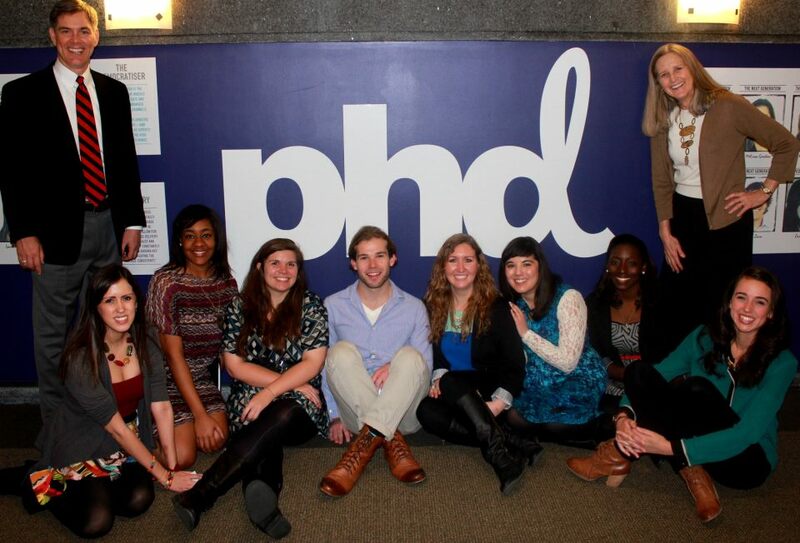 PHD Worldwide is part of the Omnicom Group, a global leader in marketing and communications. Most impressive program -- love the real-world application and the top-flight work.